The mild autumn led to a dogwood hedge in Withybed breaking into flower in late October – it usually flowers in May or June. St Luke’s little summer went on towards the end of October, followed by a cold blast as we moved to November, when it became mild again. The tree colour has been lovely after the warm summer, bright even on the stormy days we had, and lasting well into November despite the winds. There have been great berries, not because there is going to be a cold winter as tradition has it, but because of the year we have had so far: cold spring followed by hot summer. You expect the Celtic tree for December to be dark and gloomy, or at least evergreen, but the main tree for this season is the birch. December marks the solstice, when the light begins to return for the new year, so this graceful silvery tree, full of light, is very appropriate. It is also a very resilient tree, a survivor, which will grow in inhospitable places where the mighty oaks won’t thrive: this adds to its aptness as a midwinter tree. I remember a poem I learnt as a child that started “The silver birch is a dainty lady/ She wears a silken gown.” Far from being dainty, the birch is tough and strong, and its silver is more like a suit of armour! It’s a common tree in the north and west of the British Isles, the rest of northern Europe and north America, so was important in Celtic, Norse and native American cultures. Birch branches were brought into the house in England to celebrate May Day, and in Russia a whole birch tree was dressed up as a May bride, or a young woman was covered with birch leaves for this. 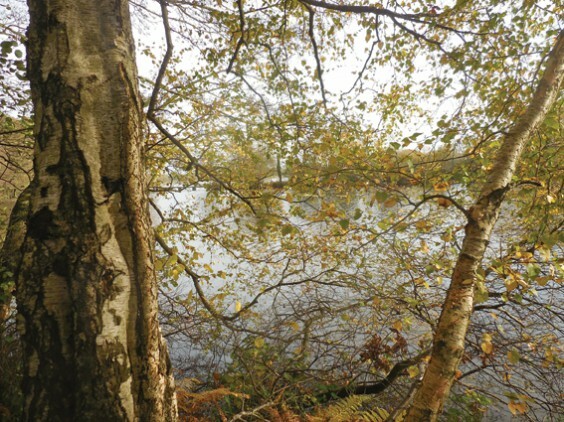 Birch was used for the fires and torches of St John’s Day – the old summer solstice celebration. In the Celtic calendar birch stands for new life, and it is one of the fairy trees believed to have magical and curative properties. Birch forms part of many old place names, often in the form of Birk or Berk. Here we have Birches Lane from Withybed Green up to Cooper’s Hill, an ancient trackway which was planted with birches, many of which reached the end of their lives recently. New trees were planted about ten years ago, but many did not survive a dry spring when they were planted. There are several in the streets of Alvechurch and other villages, and they often line newer roads, chosen along with rowan for their fast growth. Birch grows fast and rarely lives to a century. It colonises the ground in acidic areas rather like ash does on the more alkaline soils. Because of this it has often been disliked by foresters and some conservationists, who remove it to allow other plants to grow. This is not good ecology, though, as these fast-growing trees are useful in protecting young slower-growing trees. They are much better for the environment than the equally fast-growing conifers so often planted, which have a long-term harmful effect on the soil. Birch fixes nitrogen in the soil so benefits other species. In fact, birch could be more used in forestry as it is a good renewable source of wood-pulp (for paper, cardboard and especially as a biodegradable substitute for plastic and artificial fibres) without the harmful ecological effects of conifers. Every bit of the birch was used in the subsistence communities where it was often the main tree. All the wooden objects of home and farm, from chairs to plough-handles, were made of birch wood. In Scotland the branches are an important fuel in making whisky. The twigs are still much used in smoking fish and meat and were also for making brooms and whisks and for thatching. Less pleasantly, it made canes and whips for punishments. Birch is used today for smoking salt, a very welcome recent revival as an addition to our food, including in nearby Droitwich. The bark of birch trees looks fragile in its silvery lightness but is almost indestructible. If you find an old fallen birch tree trunk it will probably be just bark with the wood inside rotted away. The bark is famously used for canoe making in north America. It also burns well, so was used for candles and torches. Its oil was an ingredient used in tanning hide. In fact, burning is the only way to easily destroy birch bark. It has been found thousands of years old buried in peat bogs and virtually unchanged from its silvery, papery state. The sap is sugary and birch wine is popular in many parts of the world. Birch is a catkin-bearing tree, so now in winter small catkins will be growing on the branches. In spring the male catkins will shake out long and wiggly, like hazel catkins but a rather browner shade. Their pollen falls on to smaller green catkins holding the female flowers. The winged seeds in autumn are loved by birds especially finches, so they are spread by them as well as wind-blown. Birch has beautiful small leaves, light green and rustling in spring, turning a lovely yellow in the autumn. You may see a strange thing growing on birch – there are some on the birches outside the Lewkner Almshouses in Alvechurch. These are often called “witches’ knots” and look a bit like birds’ nests. They are made by an insect that lives on the tree and makes the twigs form these dense mats. Birch also hosts many fungi, especially the birch polypore, russule and bolete. As well as the familiar silver birch, there is another kind in the far north of Britain, the downy birch. This is browner but very beautifully scented from the resin on the leaves. I once spent ages on a Scottish campsite looking for the source of that wonderful smell! The secondary tree in the Celtic calendar for midwinter is an evergreen – the pine or fir – the word used can refer to both. Scots pine is the only native one, but firs have been planted for several centuries. None is local around here, though there are lots of planted conifers. Most of the pines around here are Monterey or Corsican pines rather than Scots. They were very popular in the 19th century, and you can see them around all the big houses on Cooper’s Hill, on the Lickeys, and in the fine Wellingtonias in Alvechurch. Scotland was once covered in pine forest. After this was lost, due to a combination of human destruction and climate change, the land became deforested. During the 19th and 20th centuries, fir and other imported conifers were used to replace them, but were not good for the environment even if they did support the paper industry. Nowadays there are reforestation projects with Scots pine, and I have seen this beautifully done around Ullapool. We have become so accustomed to these conifers that our main family celebration of the year, Christmas, revolves round a fir or pine tree, usually a Norway spruce. But when we had the hot dry summer this year many Christmas tree growers lost their crop, which reminds you that they are happier in the colder and wetter north. Trees are so important to us (however much we ignore them or dispose of them as inconvenient) that it is very appropriate that we mark the end of one year and the beginning of the next with a Christmas tree. Never mind if it was imported from northern Europe – it still represents hope and the continuity of nature. Perhaps we should bring in a birch tree this year! Trees come into my poem too, written this autumn. Thank you everyone who has said they enjoyed my year of trees, and everyone who helped me through a difficult year of dealing with cancer. I wrote the poem on the day I got good news about my progress. And I fear for it, as the cold frost hides its fingers. By Rumpelstiltskin’s slave, fools’ gold, fairy gold. Like the hard gold in this Vanity Fair of life? Promising I can eat its fruit again next year.